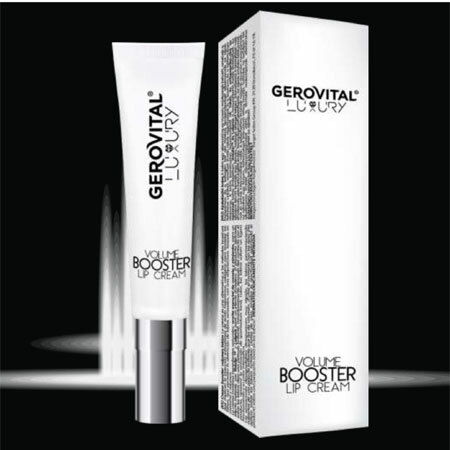 The Gerovital Luxury Volume Booster Lip Cream is an alternative to invasive methods which imply the subcutaneous injection of hyaluronic acid, collagen for lip modeling which allows for the attainment of sensual lips, with an architecture based on contour and volume. The cream combines natural ingredients: cinnamon essential oil and hot peppers for an instant effect with Volulip™ and Lakesis for a long-lasting effect. Immediately after contact with the product, you will experience sensations of local burn, heat and the lips slightly bulk-up while their color intensifies. The unpleasant sensations disappear very quickly; the lips remain covered with a glossy film which confers them with volume. Usage: Apply to clean, dry lips within the lip line. Do not apply outside of lip line. Apply as needed throughout the day. Do not apply on irritated lips. Test your reactivity by applying the product on a small area of your lips before using. Apply to clean, dry lips within the lip line. Do not apply outside of lip line. Apply as needed throughout the day. INGREDIENTS: POLYBUTENE, BIS-DIGLYCERYL POLYACYLADIPATE-2, HYDROGENATED POLYDECENE, ISOPROPYL ISOSTEARATE, CANDELLILA CERA , HYDROGENATED VEGETABLE OIL, POLYGLYCERYL- 3 DIISOSTERATE, DIMETHYL ISOSORBIDE, SYNTHETIC WAX, CINNAMOMUM CASSIA LEAF OIL, HELIANTHUS ANNUUS (SUNFLOWER) SEED OIL, CAPSICUM ANNUUM FRUIT EXTRACT, CETEARYL ETHYLHEXANOATE, SORBITAN ISOSTEARATE, PORTULACA PILOSA EXTRACT, SUCROSE COCOATE, PALMITOYL TRIPEPTIDE-38, METHYL NICOTINATE CAPRYLIC / CAPRIC TRIGLYCERIDES, PISTACIA LENTISCUS GUM, CALCIUM ALUMINUM BOROSILICATE, SILICA, TIN OXIDE, BHA, CI 77891, BENZYL BENZOATE, CINNAMYL ALCOHOL, CINNAMAL, COUMARIN, EUGENOL.